There’s a reason I put lettuce on notice. Lettuce has no business on a street taco(or inside a burrito for that matter) If your taco has lettuce there’s a good chance it’s there to hide something. 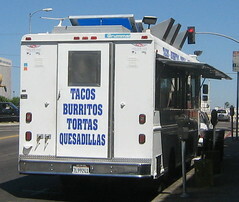 That was the case at El Delfin jr at the corner of Mariposa and 8th st near Koreatown. I ordered my staple, carne asada and al pastor and boy were these tacos a disaster. The al pastor was crumbled undercooked ground pork with a sour gamey flavor with bits of pork fat in every bite. The asada was pretty awful as well. More than half the taco was gristle and the rest of the meat lacked any flavor whatsoever. No salsa roja on earth could have hidden the flaws of these tacos. 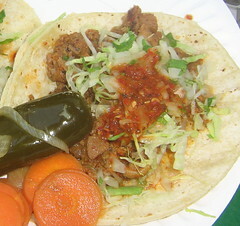 The bar has been raised high by many of LA's excellent taco trucks. I'll put LA's taco trucks up against any other city.LA is the taco truck capitol of the country. However that doesn't mean every taco truck in LA is on top of their game. i appreciate the bad reviews just as much as the good ones. thanks for staying true and honest to your taco reporting duties. So scary that there are that many mobile taco places. I love burritos with extra stuff in them. That was the standard in Chicago at their burrito joints. Although tacos don't need lettuce.